Current feature: A Christmas in 1972! Remembering the ERTYL Ford 8000 Tractor in 2012, 40 years later! Here is a story I thought I would share with everyone as we close the year. Here is a replaced toy of the past. 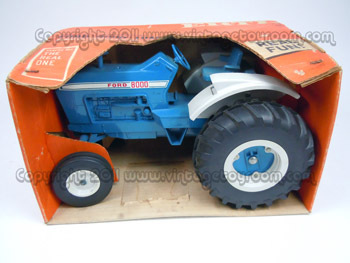 In the 1970's, Ertl Toys made this huge diecast Ford 8000 Farm Tractor that featured front Wheel Steering. 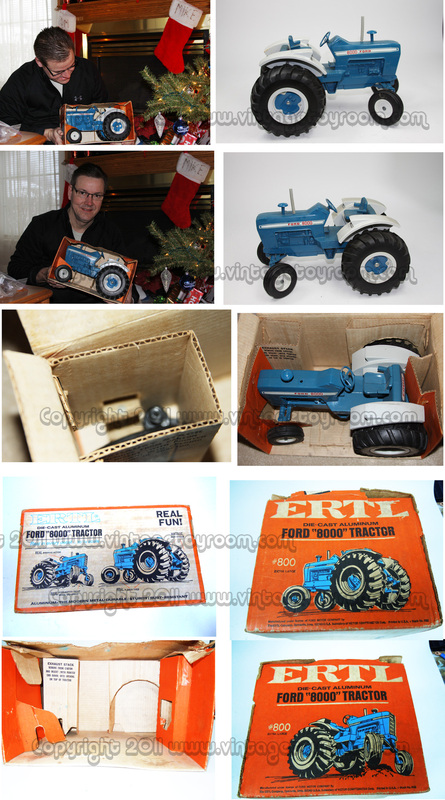 The large 1/12th scale, die-cast Metal Ford 8000 Tractor toy replica was part of my toy history. I have had the item on my radar at toy shows and flea markets for quite some time, but was unable to get one still mint in the box. Loose ones are readily found on auction sites. So what about the tractor? What nostalgia is sparked? I did not have many tractors, this one had a memory of dad attached. I had a "Sid Phiilips" friend that took it upon himself to throw it (yes throw this 13" long, 7-1/2" high and 8-1/4" 5.5 lb toy) airborn across my front lawn!). Well, how id this block of steel do? Not to bad...One front wheel did bust off the cast alluminum axel, in comes dad. My father had to redrill and use a bolt and nut to get in back into shape. While it was functional again with steering, it forever became damaged goods in my mind. like a Marx figure missing a hand, or a hot wheels car without a wheel. Click to see larger expanded image of this vintage find!